Over the last dozen years, I’ve worked with scores of CEOs and senior executives to help them build more engaged, high performance cultures by energizing their employees. 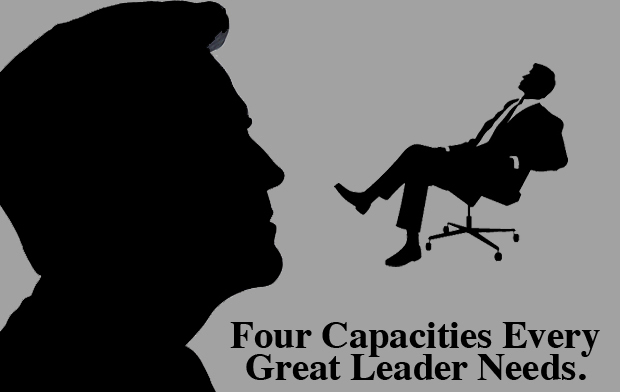 Along the way, I’ve landed on four key capacities that show up, to one degree or another, in the most inspiring leaders I’ve met. When I was a very young journalist, full of bravado and barely concealed insecurity, Ed Kosner, editor of Newsweek, hired me to do a job I wasn’t sure I was capable of doing. Thrown into deep water, I had no choice but to swim. But I also knew he wouldn’t let me drown. His confidence buoyed me. Some years later, I was hired away by Arthur Gelb, the managing editor of The New York Times. This time, I was seduced by Gelb’s contagious exuberance about being part of a noble fraternity committed to putting out the world’s greatest newspaper. 1. Great leaders recognize strengths in us that we don’t always yet fully see in ourselves. This is precisely what Kosner did with me. He provided belief where I didn’t yet have it, and I trusted his judgment more than my own. It’s the Pygmalion effect: expectations become self-fulfilling. Both positive and negative emotions feed on themselves. In the absence of Kosner’s confidence, I simply wouldn’t have assumed I was ready to write at that level. Because he seemed so sure I could–he saw better than I did how my ambition and relentlessness would eventually help me prevail–I wasted little energy in corrosive worry and doubt. We each have a range of core needs–physical, emotional, mental and spiritual. Great leaders focus on helping their employees meet each of these needs, recognizing that it helps them to perform better and more sustainably. The job of leaders is not to do the work of those they lead, but to serve as Chief Energy Officer — to free and fuel us to bring the best of ourselves to work every day. Part of that responsibility is defining, in the clearest possible way, what’s expected of us–our concrete deliverables. This is a time-consuming and challenging process, and most leaders I’ve met do very little of it. When they do it effectively, the next step for leaders is to get out of the way. That requires trusting that employees will figure out for themselves the best way to get their work done, and that even though they’ll take wrong turns and make mistakes, they learn and grow stronger along the way. 4. The best of all leaders–a tiny fraction–have the capacity to embrace their own opposites, most notably vulnerability alongside strength, and confidence balanced by humility. This capacity is uniquely powerful because all of us struggle, whether we’re aware of it or not, with our self worth. We’re each vulnerable to believing, at any given moment, that we’re not good enough. Great leaders don’t feel the need to be right, or to be perfect, because they’ve learned to value themselves in spite of shortcomings they freely acknowledge. In turn, they bring this generous spirit to those they lead.